A specialized pipe elbow for pneumatic conveying systems that virtually eliminates the friction and material degradation common to traditional elbows. It changes the direction of your bulk material flow without generating streamers, fines or creating a significant pressure drop. Pneumatic conveying systems for bulk materials have traditionally used long radius elbows to accommodate the changes in-line direction. As a result, it causes material degradation and generation of fines and streamers, which clogs process equipment and must be periodically removed. 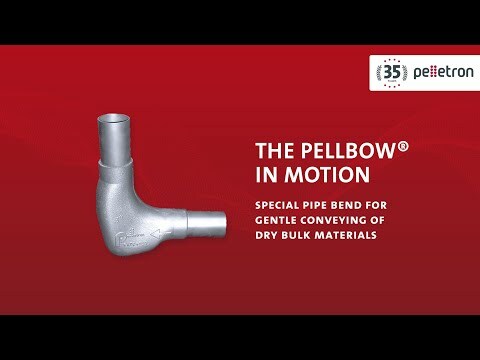 The Pellbow line from Pelletron is a series of specially designed elbows that replace the traditional long-radius style and eliminate the generation of fines and streamers. This Pipe bend to reduce fines have no moving parts; are wear resistant and have no filters or traps to clean. It completely eliminates the generation of streamers and fines typical to traditional elbows. Pelletron provides dust prevention and dust removal technologies for injection molding, blow molding, foil extrusion and other plastic conversion processes.